** Update: We have our 5 guinea pigs! Thanks for playing along. The rest of us will need to wait a couple of days for the official public launch of the online store. Groovy! I’m 95% finished in implementing my online store/shopping cart system. It’s got a few minor cosmetic things to get wrapped up, but I’m really liking how it works so far. I’ve tested it and it’s processing credit card orders just dandy. However before I go wide with a public release I’d like to have a few folks (like 5 people for now) try it out first. So if you’ve ever wanted to get my VTS videos a la carte or wanted to subscribe but couldn’t do it before because of PayPal problems or whatever, send me an email. The first 5 people who email me will get access to the in-progress store and will get to buy stuff. Plus I’ll give the beta testers a nice discount for helping me out. This way we can run the store through it’s paces before it goes fully public in the next day or so. So email me if you have money burning a hole in your pocket and the only cure is the heretofore ever so elusive VTS. I’ll update this post when the beta testing roster is full. Thanks! How long did it take you to land into the feature film business after schooling and where did you find yourself directly after college? Well, I never had any schooling in animation. No official schooling anyhow. Just learned it the hard way. I only have 1 semester of college to my name and that was 18 years ago. Heh. It’s not like I was some talented golden child my first day in animating. My early stuff sucked so bad you could actually feel the pull from the monitor like a giant vaccuum. From the time I decided that character animation would be my thing until my first feature film job offer was about 4 or 5 years (I say ‘offer’ because I turned it down for another opportunity that was not in feature film, but just as much fun). And those were 4 or 5 years of hammering hard on getting better- I was very focused. I didn’t do a lot of tinkering around. Any spare moment I had was spent animating something. The standards back then weren’t as high as they are now, either. My reel that got me my first film offer back then most likely wouldn’t get me much of an offer today. At least I don’t think it would. I haven’t seen it in a while. Heh. In the meantime I worked many different jobs in the CG field, mainly as a generalist for many years. It’s not a bad thing. Paid the bills, helped me grow as an animator, gave me motivation to keep pushing through, broadened my understanding of the entire pipeline, etc. There’s no crime in the slower road to success. Not many of us can be Cameron Miyasaki and land the Pixar gig right out of school. (and his road wasn’t as easy as some would think). The rest of us mere mortals need to work out way up through the minor leagues first. And there are far worse ways to make a living. So don’t lose heart. Just keep working, keep learning, keep growing, keep pushing to be better and know more. Natural, latent talent is an overrated myth. The consistent effort of hard work yields results. I’m living proof of that if anybody is. I present to you Breadwig: The Blog! One of my most favoritest human beings on the planet and one of my best friends to boot, Bryan Ballinger is just awesome! We first met when working together at Big Idea. Bryan is the fella that I teamed up with to write our children’s book, The Great Cheese Squeeze. Breadwig was a name Bryan and I came up with one day while riding the METRA train to work in Chicago. It came from some odd thing we had read (whether true or not was not of major concern) about the way that colonial men had for making those swank powdered wigs they kicked with back then. Seems (allegedly) that you’d take human or horse hair, put it into the shape you wanted with curlers, stick it in a lump of bread dough and bake that sucker to get it all set and shaped. Think of it as an edible curling iron that’s great with jam. Anyhow, funny name, silly logo and groovilicious funny drawings blog. Bryan’s regular portfolio site is bryanballinger.com. Check out his 3d and 2d illos there, all with his torqued twist on life. And for some real insight into the dark mind of a master, check out his love child Suxco.com. It is humor so dry that you need a glass of water to survive it. However it’s so on the mark in its commentry about the corporate speak of the 21st century that you just have to admit that it’s pure genious. I bought this shirt and wear it proudly…. Yeah, I’m a fan. Bryan rocks. As noted in my previous post, this week I’m in the hot seat over on the Cg-Char forum’s Ask The Pro. Here are some really good questions asked of me by forum member Virgil Mihailescu- along with my answers. I felt they’d make a really good blog post, so here they are. What makes a great pose? It’s vibrant, alive, it feels like it’s moving even when it’s by itself, it has great kinetic energy, even if the character isn’t moving much in the scene. It communicates immediately, clearly, precisely and with such a sense of life. A great pose just jumps out at you. It breathes just in how it feels. Everything feels right, nothing feels forced or awkward. How much time do you spend on your poses? As much as I need. If it takes me more than an hour to get something right, then I take that time. I’ve spent hours on a single pose before. And then the next day I’ll come back and tweak and improve and plus it for another hour. And why not? If I find it then it’s done, I’ll never have to touch it again. So why not take the time? And sometimes the pose just jumps out and it’s there in 5 minutes. I take as long as I need until the things that I describe above about great poses apply to what I have just made on screen. How much detail is in your thumbnails? Not much. Just the basics, really. Body, head angle, eyes, basic facial expression, maybe fingers now and then. But my thumbs are literally fleshed out stick figures. I save the detail work for the Cg puppet, since that’s where the detail will eventually be rendered for production. In thumbnail stage it’s about capturing the larger strokes and ideas. What parts do you spend more time on? I spend a lot of time working facial expressions and hand positions that sell the emotion. That and head angles. Again, if I find it and communicate it I am able to move on and have great confidence with the thing. Another thing I like to work on a lot is the internal weight of a character- the sense that their body parts have meat and muscle and substance- that things are settled and lying where they like to lie down, that a character feels comfortable in their own skin when they move, stand, talk, gesture. It’s hard to describe, but it’s something I take a lot of time trying to capture. What’s the hardest for you to nail down? All of it. Heh. I tend to spend a lot time trying to get the face to feel right. So much emotion can be expressed so powerfully there that it’s super important for me to nail that and communicate the thought immediately and clearly- but without going cliche’. Swing on by Cg-Char for more if you like. Today is VTS delivery day! Namely today is the day that I need to deliver VTS17 for July. It should be ready for you faithful subscribers late tonight or first thing in the morning. As in my night and morning here. If you’re in India then it’s already night and morning will be night again… or something like that. Anyhow, within 24 hrs. Secondly I am finalizing the construction of my online store/shopping cart. This will allow non-PayPal using folks to get involved with the VTS and other goodies as time goes by. That should be done by the end of this week if all goes as planned. Keep an eye here for more info later this week or this weekend on that. Thirdly, I found this neat post on some skyscraper rating website with tons of very nice pictures of Cuiaba’, the town I’m currently living in Brazil. Check it out for lots of cool photos and such to get an idea of the place. Lastly, this week I am enjoying the honor of being featured on Cg-Char in their Ask a Pro section. I’ve been involved with Cg-Char since pretty much it’s inception over 11 years ago, so it’s fun and nice to be able to keep giving back to the community in that way. Plus Rick May (founder of Cg-Char) is a super swell guy and I’m always glad to lend him any support I can. So go on over and ask me a question and I’ll answer it. I hope. I’m almost done with my fourth installment of the Great White Hope of Indy Animators. While I’m mulling over and tightening down those few logical loops I wanted to take a moment and drop a note here letting folks know what’s happening with my Video Tutorial Service (VTS) this month. July is customer appreciation month! Or something like it. In addition to the normal video tutorial I will be making an extra free VTS video this month for my subscribers. So anyone who is a subscriber to the VTS in July 2006 (even if you join anytime in July) will get two videos this month instead of just the usual one. 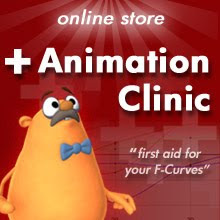 So that will be like, what- An hour and a half of animation training for $14.95? What’s not to like? What will the videos be about this month, you ask? The topics for July are a continuation of the acting/scene blocking process (using a production scene as practice), as well as an indepth discussion of open vs. closed facial posing for emotional impact and then moving into second phase blocking with breakdowns and such. The extra video will be a comprehensive primer on how to easily pose-test and time your scenes (even CG scenes) in a fast, flexible and practical way that should speed up your workflow a lot. This extra free video won’t be free in the future. If folks want to get it after July they’ll need to pay for it. So if you’ve been thinking about checking out my VTS but have been waiting for a decent reason to subscribe, well, in July you’ll have two of them. OK, that’s enough shameless plugging for now. I hope you’ll forgive me for trying to make a living. Next post: Part 4 of TGWHFIA. I’ve been blah, blah, blah… part 1, part 2, part 3. Read, sing, laugh, make a burrito- Enjoy! Now for part 4! The burning question that brought us here is: How can an indy animator make a living from their animation? Regardless of distribution paradigms, we’ve shown in previous installments of this conversation that the numbers game is pretty well stacked against the indy from the start. The end user value, while it exists, doesn’t give a lot of room for low volume content- which typifies the independent product. When the value is pennies per minute you need a LOT of minutes, or a LOT of buyers (preferably both) in order to survive. Either one is typically very expensive to produce and has a fine way of killing an independent whose typical cash reserves wouldn’t buy a decent used car. Some distribution models have very difficult ports of entry but substantial compensation (TV, feature film, etc.). Yet others have very easy ports of entry but with laughingly crappy compensation (YouTube, GoogleVideo, AtomFilms, etc.). And we have proposed a possible distribution model that has less difficult - yet still existant- port of entry with compensation patterns that, while not terribly substantial, are not total crap, either. So whether it’s the big compensation lottery or the death of a thousand cuts freebie system or something in between, either way there are challenges and difficulties. Yet we have hope that if we can find the right paradigm, the right business model, the right combination of luck, talent, skill and content- we can carve out a living here just animating our own thing and appealing to our audience with nothing else. Is this a reasonable hope? Personally, no, I don’t believe it is. It’s an idealistic hope, a naive’ hope, a hope of youth- but I don’t think it’s terribly realistic. Sure you hear stories of the lucky few who stumble upon fame and fortune when the gatekeepers “discover” them. But if that’s your tack just buy a lottery ticket. They’re cheaper. Remember that word I ended the last post with? Mosaic. What is a mosaic? Well you artsy fartsy types know that a mosaic is a picture made up of many small pieces of stone or glass that are different colors. None of the pieces in themselves constitutes a major part of the whole, but when properly arranged a larger picture emerges, best viewed from a distance. And that’s really what I think it will take to succeed as an independent animator. Not even the guys who have somehow managed to have notable success as independents have had the luxury of doing nothing but their own content and nothing else. It’s just not feasible. Indy luminaries like Don Hertzfeld, Bill Plympton and Michael Sporn have all made a go by mixing in many different business pursuits. Their income patterns are a mosaic of different pieces. A film here, a teaching gig there, a book, a speaking engagement, a commercial, another commercial, some merchandise, a film festival, some DVD sales. Each piece is not enough to live off of on it’s own. But if you arrange them all together you have a nice picture of sustainable income for a clever, hardworking and pragmatic independent animator. There is really so little chance of being able to “just do my own content” and make a go of it just from the content. Yes, the content has value, yes we should try and maximize that value, but for all but the most extaraordinary of circumstances that value isn’t going to be enough to pay all our bills. In the right distribution model it can pay some, but not all. You need more. And this isn’t such a bad thing, really. Content does have value to end user audience members. There are definable, quantifiable and existing ‘taste niches’ that do exist. The best way to maximize the harvesting of the inherent value is to focus on a high-percentage target with content suited to that niche’s proven tastes. Who is thinking like this? What gatekeeper has their business model built on this thought equation? Is it an invalid equation? Is this all just fairy dust in Trebuchet 10 point? I don’t think so. So far we’ve proven that yes, end users do value content. And we have given good reason to presume that a definable market for animated content exists. The thing that remains is to meet the needs of that market. Instead of trying to make an online content delivery system that appeals to all tastes in order to make a profit and subsidize the sizeable infrastructure of such a system, why not niche target an audience, focus in on their tastes, find a way to advertise to them, draw them to your site and see if you can’t get a higher percentage of paid downloads as a result? The server load per dollar spent is far more profitable on a 7-minute short film than a 44-minute TV show. For the same dollar revenue you can cut your infrastructure costs by 80%! True it’s not as simple as all this, but it does make some sense, no? It is possible to think smaller and end up getting higher margins in the process. Thus my statement above that a big part of the problem is the tendency toward a global approach. It’s a kind of disease and it’s seeped into every area of our commercial lives it seems. Why is a business today not valid or viable if it doesn’t try to conquer the world? Why is it a bad thing to serve a target niche of customers and meet their needs in a highly pro-active and meaningful way? It’s a much kinder, less ‘corporate’ way to do things. There’s no need to have every gatekeeper try and be some Genghis Kahn of the media business landscape. Why not have a few smaller sovereigns? What’s so bad with being a Luxembourg in this whole thing? There’s an old saw that says “All politics is local.” I think the same is true here. “All taste is personal”. But there are people who share these tastes. So meet them in a more personal way and let them know you’re here and give them something they’re highly inclined to buy. In a metaphorical sense, let’s do away with the ‘hair salon’ in the cold, faceless cinder-block hell we call Walmart. Bring back the corner barber shop where all the guys know each other and watch baseball together. So to speak. So now I’ve laid out a possible business plan for a kinder, gentler, more targeted gatekeeper (there still remains a number of side issues with this, but I can get into them later). But that still doesn’t address the initial problem- how does an independent animator hope to make a living from their work? One word: Mosaic. Huh? You guessed it, part 4 coming right up! Til then all feedback, death threats, attacks on my sanity and words of glowing support are all welcome in the comments section of the bar & grill. OK, so those numbers don’t seem like much to write home about. Still, there is value there. The iTunes numbers seem to be the most encouraging. And guess what? People are buying video content off of iTunes- and lots of it, too. And mind you- this is all content they could have for free if they knew how to run a VCR. But they’re willing to pay for it to have it on their time, their iPod, their computer- to make it “theirs”. So let’s go back to my online viewings and apply the numbers. One thing that I think would be wise to do is to offer two versions of my films. The first would be a low quality compressed streaming version that would be free in order to win fans. I don’t have the ability to slap a name like Pixar or Disney on things, so the viewership would have to be earned. Then I could offer a high quality version that people could purchase to keep for their own collection. Let’s assume that of the 80,000 or so online viewings I’ve had for Lunch that I do a very good job of entertaining my audience and that maybe 10,000 of those viewers would end up paying for a keeper version. Apple charges about a 28% distribution fee for stuff they sell on iTunes. So with a selling price of $1.99 per film, that would leave a decent $1.43 passed on to the content creator/producer- in this hypothetical case, me. Quick math type stuff shows that if I could get 10,000 people to buy a higher quality version of a short film that I’d stand to make a little over $14,000. Not enough to live off of, but dang, that’s not too bad for a part time effort. What if I made 3 or 4 shorts per year, instead of one every 3 or 4 years? While not a full living in itself, it might be a viable portion of a collage of money earning activities. After all, even if you could find a way to market it effectively, what’s to keep one person from paying a buck for your film then emailing it around the world? …. Even if there was a secure way to sell your work on the web, you’ve got a lot of stiff competition, like Strongbad podcasts…. for FREE… and really funny! If you want to sell something, you have to make sure it’s even better than that, or else have lots of merchandise to sell. Good questions. But I think it might be overlooking something innate in human nature, namely the desire to be involved in an exchange of value. For reasons that are not entirely machiavellian people actually do want to buy things, even if they could have the same thing for free. We find this in the very poor river people here in Brazil. We roll up on a big medical boat and if we give them the medicines for their health, they have a laid back attitude about actually taking the medicines. But if we make them buy the medicine- even if the value exchanged is massively out of alignment with their true value (trade a strip of beef jerky in exchange for a full course of anti-parasitic medicines worth $100) - then we find they take the pills religiously. For some reason we’re wired to want to be involved in this value exchange. The basic question here is: Does what I have to offer have enough latent value to cause people to download and have their own copy for $1.99, even if they could watch it for free? Well, I don’t know. But people do pay that kind of money for video online. So while copies of these things can easily be had for free- and in my own imaginary business model a copy of my own stuff would be free in streamed format- if the stuff is any good it’s not unreasonable to assume that somebody would pay to have a copy of their own in higher quality. Piracy does take a dent out of all media businesses, but record companies and movies studios aren’t exactly starving for sales, either. People still want to buy things- it’s the transaction, the exchange of value for value that they want. It’s a social thing. So maybe the question isn’t “If Homestar Runner is free, then shouldn’t yours be free, too?” Rather maybe the question should be “If people are willing to pay to have a copy of free things they really like, shouldn’t Homestar Runner be offering people the chance to own their own copy?“. Maybe the looking glass is pointed the wrong way? But all this is rather moot at the moment. The problem is I’m not on iTunes. And the liklihood that I could get my own little spot on their Short Films page is next to nil. I’m just not worth their trouble, not at a measley 10,000 total paid downloads per title. And while it is true that in cyberspace there is no limiting physical shelf space like Walmart or Virgin Megastore, there is still limited screen space. Why take up precious promotion pixels with a product that doesn’t promise to move hundreds of thousands of downloads? This is another flaw in a lot of “long-tail” talk- the argument that digital distribution has no shelf space battles. Hogwash. Those 1280×1024 pixels are darn precious! Nobody wants to waste them. Sure you can search for the content you want, but you can do that with Google already. Most of the long-tail discussion centers around how distributors can cash in on the diffusion of media tastes. Next to none of it really applies to the little guy actually making the content- at least not if he wants to make a living from it. So really, instead of doing away with the gatekeeper system, iTunes has just made Apple the new gatekeeper. Always with these gatekeepers! So in my next post I address what I think is needed to get around this. In the meantime you guys tell me if I’m smoking crack here. Heh. In my first post on this topic I covered why the ad-revenue sharing system online isn’t much to put your hopes in as an indy animator. The reason being that in they eyes of businessmen content has no direct value- thus the need to share any revenues with content creators is next to none. So the conversational logic drifted to the idea of having direct consumers of the media pay for it since they must value it if they watch it. I’ve been a person who has made some animated shorts and has been blessed to have them seen by tens of thousands of people over the years. My latest short “Lunch” has been viewed online about 80,000 times when you combine all the various places it’s been hosted, with who knows how many viral viewings. Not great by Hollywood numbers, but not shabby for some schmuck in a spare bedroom. Imagine if there was a system whereby I could expect some money for each of those online viewings? Or maybe even just a portion of them? Maybe it’s not enough to make a decent living from, but it’d be enough to get me seriously thinking about making more films to show, not less. The question that remains is: Will end customers pay? They obviously value the content- they watch it. Can we measure this value in dollars and cents? When thinking of these things we mustn’t ignore a fundamental aspect of the world of business: ultimately it is the buyer who sets the price. The same holds true for media content. Suppliers can try to elevate prices, but sooner or later things settle into a price point where people feel there is real value. There are several major areas of content, so let’s try to find some end user value trends for each of the following: TV live action, TV animation, feature film (live action & animated) and music. The Simpsons is arguably the most successful animated TV franchise in all of history. It’s content is widely available (for free) to end user audiences via vast syndication all across the world. Yet it still sells like hotcakes in DVD format. A typical season of The Simpsons on DVD has a street price of about $35.00. That’s $35.00 (3500 cents) for 550 minutes of content. That comes out to an end user audience value of roughly $0.06 per minute of content. (3500 cents divided by 550 minutes equals 6.36 cents per minute). In the U.S. right now there isn’t a hotter TV show than LOST. The DVD cost for the first season of LOST is about $60.00. Let’s assume we’re paying for just the show content (not counting extras, commentary and other ‘value adds’). That would be 26 episodes at 44 minutes each. (A season of shows in the U.S. is 26 weeks, an hour long program is 44 minutes with 16 minutes for commercial breaks). That’s 1144 minutes for 6000 cents, or roughly $0.05 per minute of content. So the average market value to end user consumers of top rated TV content (ie: what they’re willing to pay to own it and watch it at their leisure) is about 5.5 cents per minute of content. Now let’s look at feature films. A feature film has a typical in-theater cost of $9.00 per ticket. An average runtime for a film is 110 minutes (more or less). So for the big surround sound, big screen, buttered popcorn version of the experience the end consumer audience member is willing to pay about $0.08 per minute of content, but it’s fleeting- you can’t take a copy of it with you out of the theater. That same film in DVD sells for $17.00, resulting in an end user value of $0.15 per minute, the highest value given so far for content. That is until we get to online short films. A short film bought on iTunes for $1.99 that is 6 minutes long yields a nice consumer value of about 33 cents per minute. Many of these shorts are available in other venues in higher resolution, yet they still sell well. Pixar had sold 250,000 copies of their shorts within the first month or two of putting them on iTunes.